Travel by planes, trains and automobiles is expected to include a record 103 million Americans journeying 50 miles or more during the holidays. According to AAA, that figure is an increase of about 1.5% from the same period last year. Mike Right with AAA Missouri expects the company to have an increase in roadside assistance calls nationwide during the Christmas and New Year’s time. Right tells Missourinet about six million people are expected to fly and 3.5 million will use other forms of transportation during the holidays. “As usual, the vast majority of those travelers, about 91%, will be traveling by motor vehicle. That’s a record setter as well,” says Right. 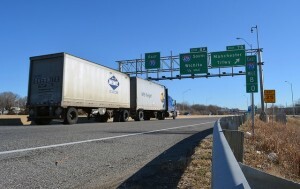 He says a record one million Missourians will travel 50 miles or more this holiday season. Right credits an improving economy for the increases. “We’re almost completely out of the recession that started back in 2007 or 2008. We’ve seen unemployment decrease substantially. We’ve seen consumer confidence rise, as well as disposable income, and wages are up,” says Right. The average price of unleaded gasoline in Missouri is 2.06 a gallon, up from 1.76 this time last year. The national average is $2.26 a gallon. Right doesn’t expect a spike in gas prices during the holidays.